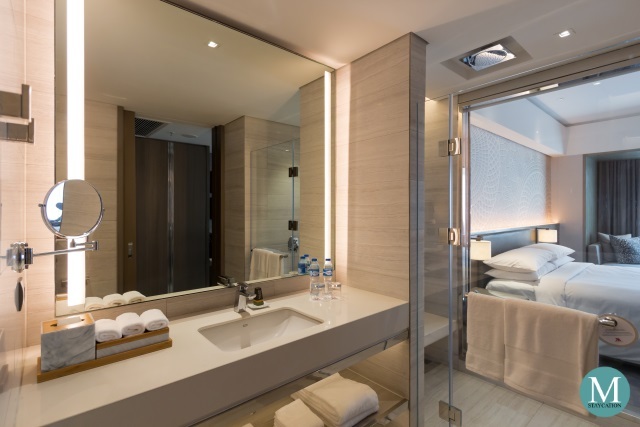 The Deluxe Room is available in a King Bed and in Twin Bed configuration, but aside from the bed, the number and size of the furniture inside the room was kept to a minimum, without diminishing their functionality. This allows for more livable space to be enjoyed by the guests. 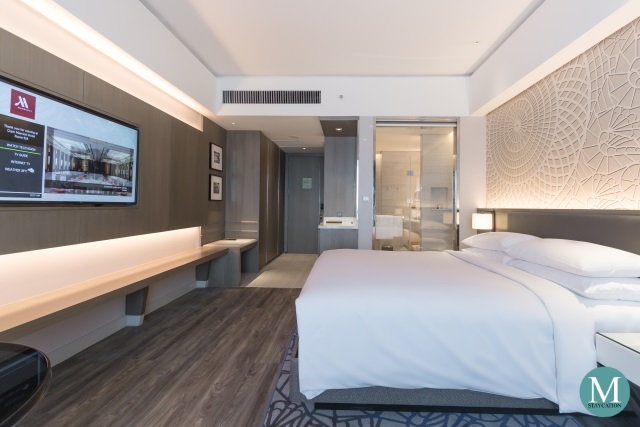 Just like Manila Marriott Hotel and Bangkok Marriott Marquis Queen's Park, Clark Marriott Hotel furnished its guestrooms with a round dinner table instead of an executive writing desk. Clark Marriott Hotel went one step further and also removed the office chair. The dinner table is now integrated to become part of the seating area, which is perfect for leisure travelers and staycationistas. 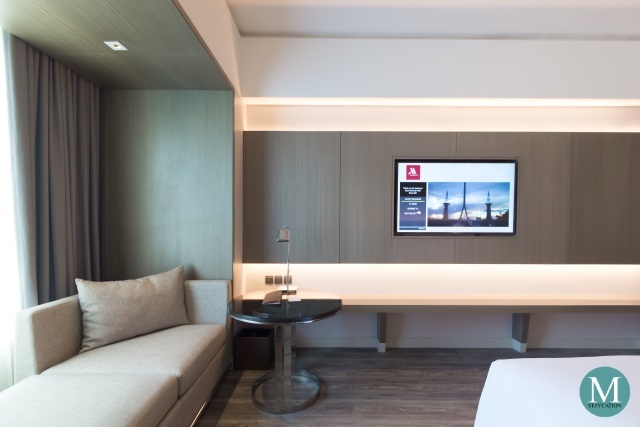 This also encourages business travelers to just relax and not work in the room. Should you need a proper chair, Clark Marriott Hotel being a five-star hotel will be happy to provide you one. 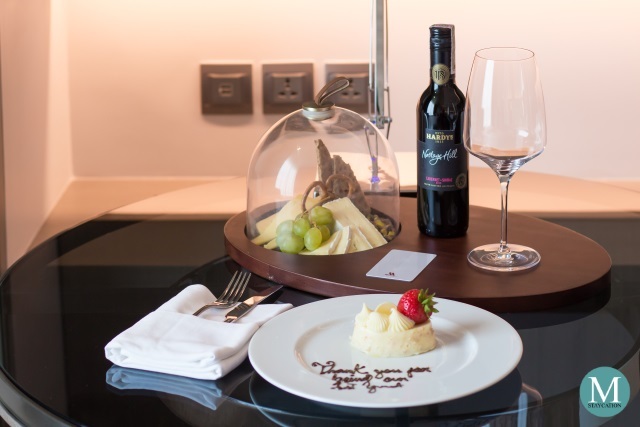 Being the first checked-in guest on record of Clark Marriott Hotel, a cheese platter and a bottle of wine were sent to our room together with a cheesecake with a thoughtful message written on the plate. It reads "Thank you for being our 1st guest". I highly appreciate any gesture of gratitude, no matter how grand or simple it may be. 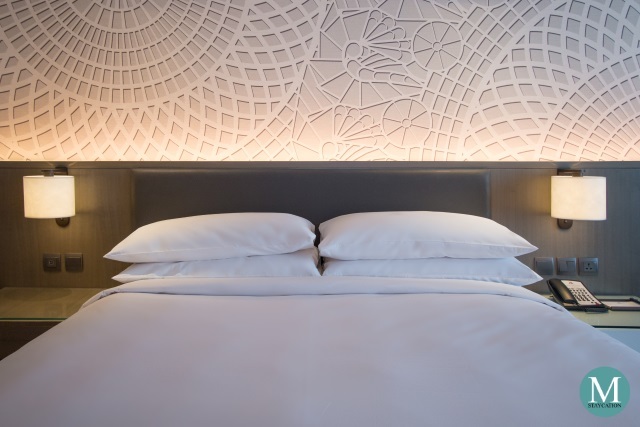 As mentioned earlier, the Deluxe Room has design elements inspired by the local Kapampangan culture. The feature wall, for example, is designed with the patterns of the giant Christmas lanterns of San Fernando City. The same pattern is also found on the bed's carpet and on the carpet of the corridors. Universal power outlets are available on the bedside tables and next to the dinner table. Wi-Fi internet is also available inside the room. 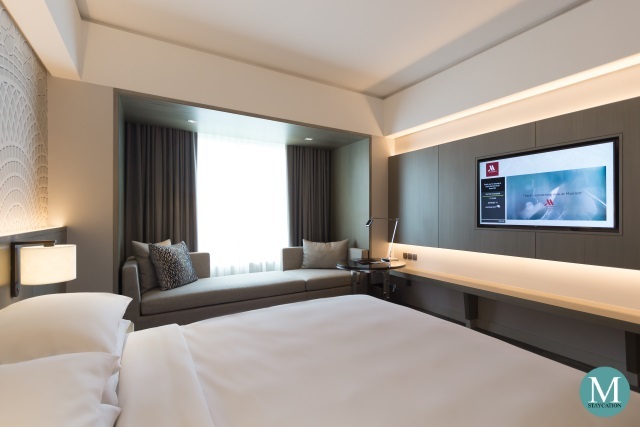 The room is also equipped with a 55-inch LG Smart Full HD LED television with local and international satellite channels. It also has a pre-installed YouTube application so you can directly play YouTube videos. You can also mirror your smartphone to the LED TV. The minibar is located right across he luggage rack. It has a mini refrigerator and an electronic water kettle, together with glasses, cups and cutlery. 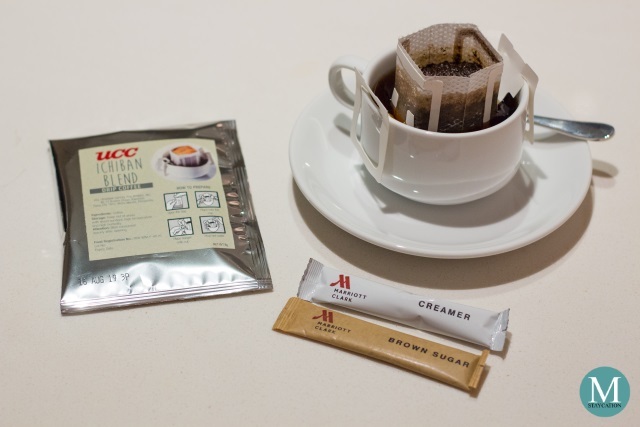 I am super impressed that Clark Marriott Hotel provides complimentary UCC drip coffee and Dilmah teabags. 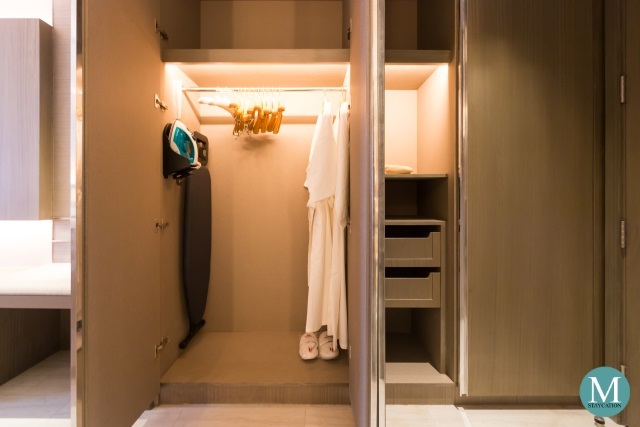 Two sets of bathrobes and bedroom slippers are stored inside the closet cabinet. There's also and iron and ironing board. Wooden and satin padded clothes hanger are also provided. An electronic safe was not available yet during our stay but I am sure that one will soon be installed per room. 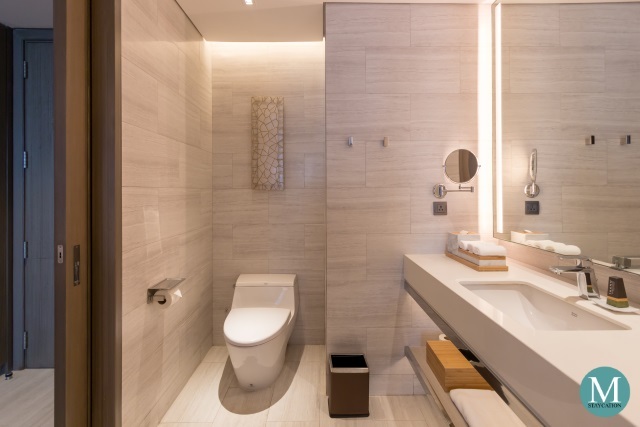 The deluxe room has a three point bathroom layout. Notice the ornament hanging on the wall above the toilet is also inspired by the traditional Christmas lanters made of capiz shells. Unfortunately, the toilet is not installed with a bidet spray. 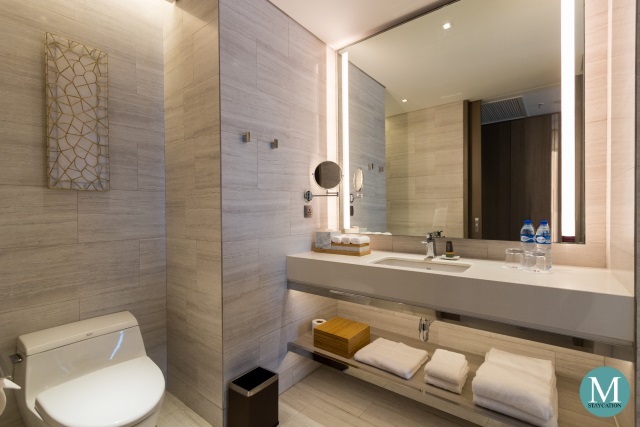 The bathroom has a single vanity with a well lit mirror and a spacious countertop for your personal toiletries. Towels are well organized on a rack under the sink. 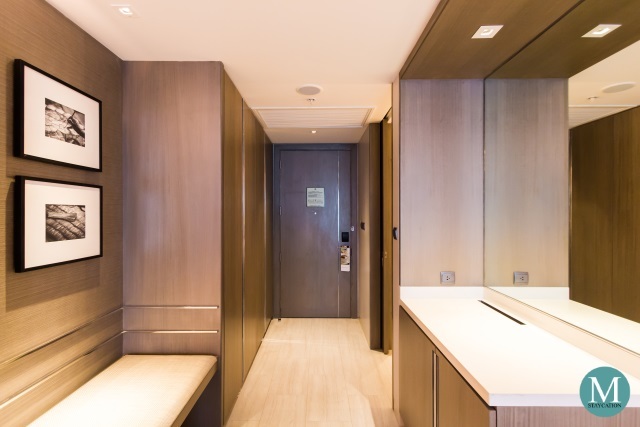 Two complimentary bottled water are provided inside the bathroom. If you need more bottled water, for coffee or tea, just call house keeping. The bathroom doesn't have a bathtub but do have a walk-in shower. I has both handheld an rainfall shower heads. Water pressure was excellent, however, it a while before hot water flows out of the shower. 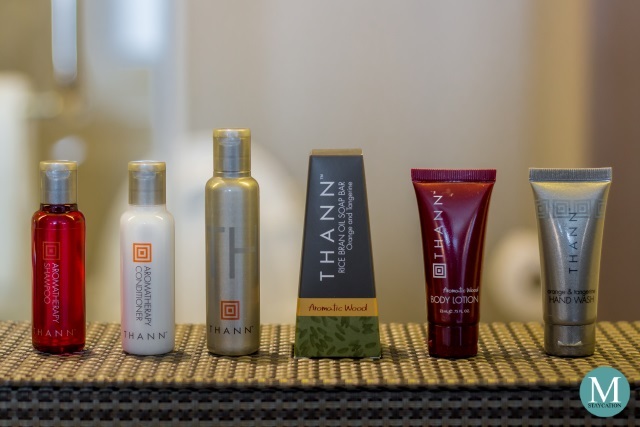 Consistent with the brand standard, guests are provided with bath amenities from the Aromatic Wood Collection by Thann. The complete set includes shampoo, conditioner, shower gel, hand soap, body lotion and hand wash gel. 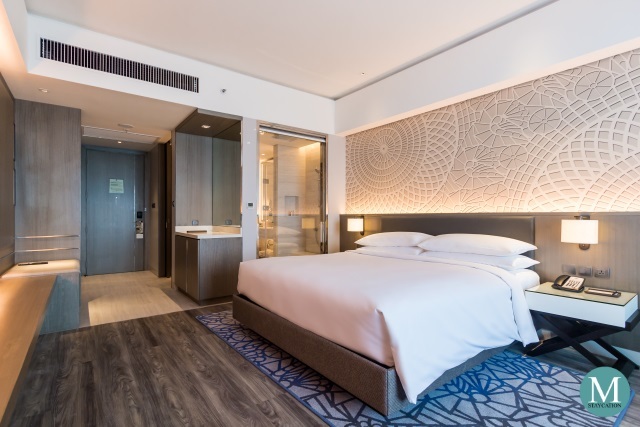 The Deluxe Room is ideal for business travelers assigned in the Clark Freeport Zone as well as leisure travelers with connecting flight at Clark International Airport. 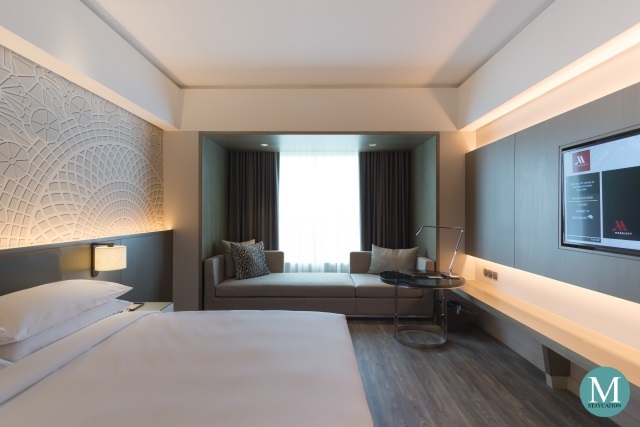 It is also perfect for couples or small families in nearby cities who would experience a staycation in an international luxury hotel brand for the first time.